The 3Com NBX splitter is to be used to power any 3Com NBX ethernet phones (1102/2101/2102/3102) using a 3Com 12-Port Ethernet Power Source or 3Com 24-Port Ethernet Power Source. These splitters work with a NBX phone regardless of whether they are versions "A", "B", or "PE". No splitter is required to connect a "PE" phone to a POE (Power Over Ethernet Switch). 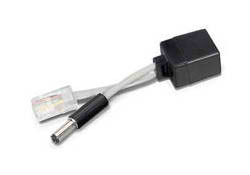 This particular splitter is not required to connect a "non-PE" (A or B series) to any POE Switch either but it does require a NBX Phone Power Module. One splitter is required per NBX phone.